eWords Online is a web-based searchable database of long form, interpreted charge wordings for prosecution of all Criminal Code, Controlled Drugs and Substances Act, Youth Criminal Justice Act, DNA Identification Act, Firearms Act, Food and Drugs Act and Young Offenders Act. This component of eJust CMS is available as a separate application. eJust Systems retains a legal firm to monitor, interpret and support changes to legislation and has a database of over 5000 variations of long form interpreted charge wordings for prosecution with some dating back to offence dates of 1955. Wordings are searchable by keyword, section number, dates and wildcard. The database includes retired wordings and the date search feature allows for current, historical, all or a specific offence date to retrieve the wording which was in effect as of that date. There are also special notes applied for some charges related to sentencing options and whether any approvals are required to proceed with a charge. 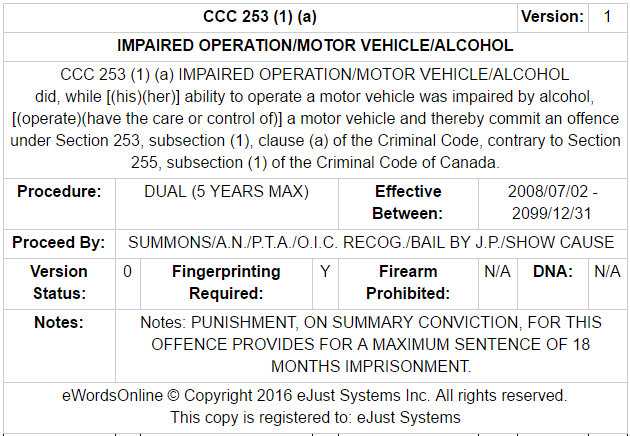 The database is capable of holding other wordings, such as Provincial Offences and Municipal By-law charge wordings.